We are extremely pleased to announce that this year’s Fringe Central social space will be hosted at The Dragonfly located on Theatre Row at 6510 Santa Monica Blvd, for the second consecutive year. We all owe a huge “thank you” to our partner at this legendary nightclub, owner Anthony Belanger. Fringe Central is the community center of the festival, featuring free programming, a bar, food trucks, Fringe merchandise, major Fringe events and Concierge staff. 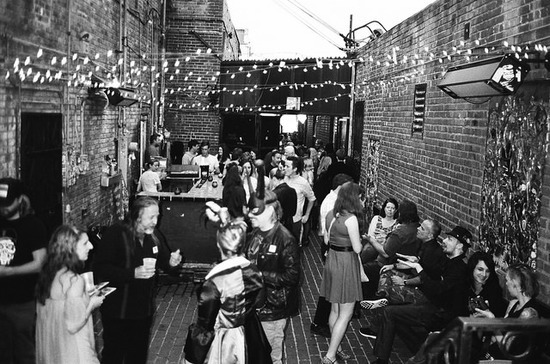 The space serves not only as a place for Fringe-goers to unwind, but also as a gathering place for those wishing to network, distribute flyers or hold meetings. Fringe Central is also home to the Fringe Concierge service. Staffed with friendly faces deeply familiar with the operations of the festival, Concierge assists Fringe-goers with tickets, times, information and merchandise. This is also the location of Bryan’s Bar, the infamous Fringe watering hole, designed as a place for artists, audiences, producers and local community members to mix and mingle. Anyone with a Fringe Button will receive discounts on Fringe bar items as well as deals at local Hot Spots. Fringe Central will officially open to the public on June 8th. There will also be a Fringe Runway event, a Fringe Prom, a Rock n’ Roll themed karaoke party and regular installments of Fringe Cabaret (the sampler platter of the Hollywood Fringe buffet). The venue is 18+ only.